What Do We Mean When We Say “Brain Waves” ? The Brain is made of billions of brain cells called neurons. Neurons are interconnected and communicate with each other by sending electro-chemical signals. When large numbers of neurons send signals at once, a significant (but not too high) electrical activity is generated – and can be measured using sensitive equipment like EEG (See Below). The Brain (collectively by the firing of neurons) can generate up to 10 watts of electrical power. So “How many times the signal goes up and down” is the frequency. Even though the brain doesn’t have one pure wave, this is our approximation of the electrical activity of the brain. What Are the Brain Waves, and What Do They Correspond to? Around 15 to 40 cycles per second (Hertz) : These are Beta Waves . The most alert and Hyper ones. A strongly engaged mind. 5 to 8 cycles per second: These are Theta waves. Think about when you’re drowsy or day dreaming. Someone driving for a long distance on a freeway might go to that stage. 4 cycles and below per second: This is when the Brain Waves are called Delta waves. It corresponds to the stages of deep sleep.. Below 2 cycles per second the sleep becomes dreamless. Note that the cycles never reach 0 , because that would mean brain death. Cool Applications of Brain Waves? To illustrate how our brain activity level changes as we sleep , consider this: When we go to bed and read before attempting sleep, we are usually in low beta. As we put the book down, turn off the lightsm and close our eyes, our brainwaves will descend from beta, to alpha, to theta and finally, when asleep, to delta. The Theta Brain Wave activity stage is sometimes associated with getting good and creative ideas, for example when running a long distance and alternating between the Alpha and Theta states. According to the same source, the attentive or deep relaxation (alpha or theta), produce increases in the levels of beta-endorphin, noroepinephrine and dopamine, linked to feelings of enlarged mental clarity and formation of rememberances. It is ideal for some of the proper functions of the right hemisphere. Remember that this ”brainwave frequency” is an approximation of the frequency of the overall electrical activity in the brain – in other terms, it is something we conceptually created, and it somehow serves like an average. So, although one brainwave state may predominate at any given time, depending on the activity level of the individual, the remaining three brain states are present in the mix of brainwaves at all times. In other words, while somebody is an aroused state and exhibits a beta pattern, there can also exist a component of alpha, theta and delta, even though these may be present only at the trace level. What are Binaural Beats? More Relevant Things? A further application of this concept of brain waves is what’s known as ‘Binaural Beats’, which provide an interesting insight. H. W. Dove discovered that when signals of two different frequencies are presented separately for us to hear, one to each ear, the brain detects the phase variation between the frequencies and tries to reconcile that difference. That is done by producing a third – imagined – sound which has the frequency of the difference (heard only inside the mind of the listener). So for example if you hear – through your headphones – (Note this only works by using a headphone/earphone because otherwise it is very hard to hear two different sounds in each ear), a sound with a fixed frequency of 200 Hz in your right ear, and another sound of fixed frequency of 220 Hz in the left one, the actual sound that you will hear in your mind will be a 20 Hz one… This is the binaural beat. Note : The brain requires about 7 minutes to entrain, or fall in sync, with the audio stimulus. In practice, around 15-30 minutes of listening time are needed to experience results of the binaural beat. 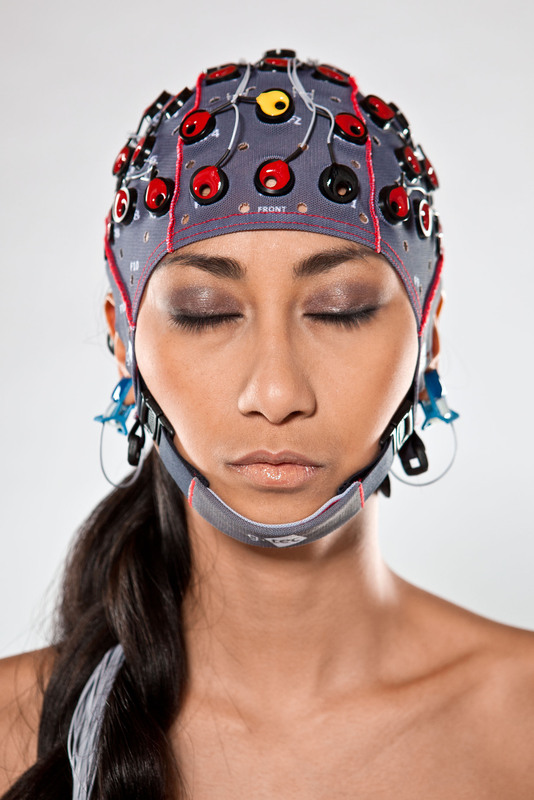 What is an EEG by the way? EEG: electroencephalogram. Made of small metal discs with thin wires (electrodes) that are placed on the scalp. These electrodes detect the brain’s electrical activity and send signals to a computer to record the results. This entry was posted in Education, Health, Knowledge & Education, Psychology, Science, Thinking and The Mind and tagged Alpha Waves, Beta Waves, Binaural Beats, Brain, Brain Frequency, Brain Waves, concentration, Creativity, Delta Waves, EEG, Learning, Meditation, Mind, Music and the Brain, Relaxation, Studying, Theta Waves, Thikning. Bookmark the permalink.